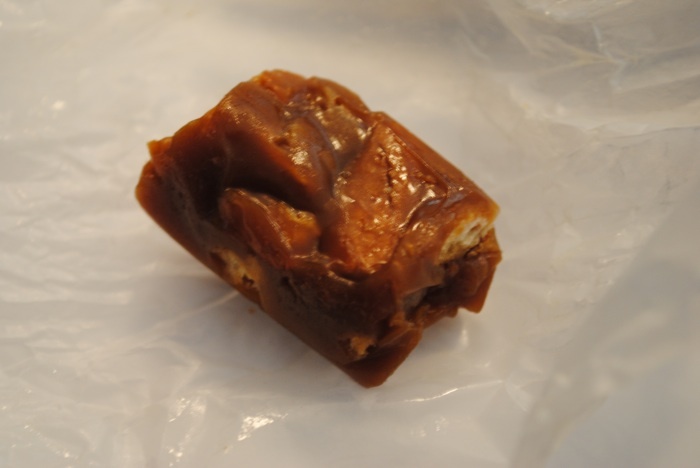 You guys should all know about my quest for finding the perfect salty caramels. I read about this company liddabitsweets in Real Simple Magazine, and I think they have also been featured in O Magazine. I read about their beer and pretzel caramels and had to try them. I won't lie at first the shipping cost swayed me not to order anything (I think it was round 20 dollars) so I put a bunch of things in my cart and ended up not ordering anything. But then after a month or so I came back. 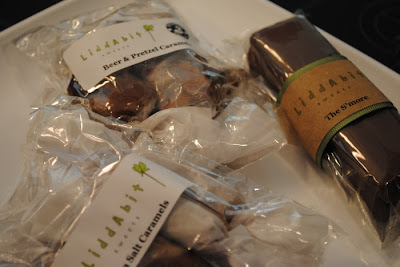 I ordered the beer and pretzel caramels, the sea salt caramels and the s'mores bar. I was so excited for this package to arrive (it took a lot longer than I thought it would!) I tore into it right away. I must say I am not a beer drinker at all and the beer and pretzel caramels were a little bit strong for me, but if I could have this caramel with just the pretzels and not the beer flavor I would be in heaven! Funny thing though, even though the taste was a little strong for me, after I finished one I immediately wanted another one! 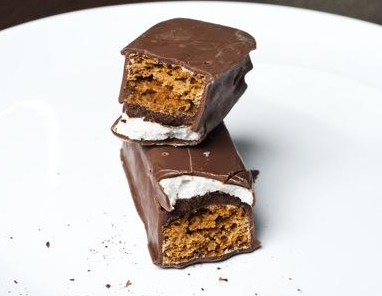 The s'mores bar was delicious. It had the perfect amount of everything in it, the combination was really tasty! But my favorite of all favorites were the sea salt caramels. I've eaten a lot of these in my day, I've ever made my own, and these by far were the best caramel I've ever had. The sweet and salty combination was perfectly balanced, and the consistency of the caramel was absolutely perfect. I wanted to share this with a foodie friend of mine, but after just two days I ate all six of them. I couldn't stop. They were like a drug I could not get enough of. I will be ordering from them again soon there are so many other things I want to try (I'm a lollipop addict I must try these.) I also want to say I love this little company (it's run by woman, and they use all local and organic ingredients when they can), they need money for more equipment and to hire full time staffers, if you want to help go here. I would go work for them if a) I was awesome enough to live in brooklyn, and b) they paid me in caramel. Thanks so much for the shout-out, Natasha! We're thrilled that you enjoyed everything. FYI, shipping prices will be going down in the next few weeks - it's been really hot here in NY so we've had to ship express with ice packs and such. Looking forward to sending you some more sweets soon!